Our Legislative Librarian Cathy Martin has posted a memo with a list of 212 bills eligible for the short session because they passed one house prior to the May 24, 2007 crossover deadline. I had posted last month details on the adjournment resolution that governs the 2008 reconvened (short) session. In addition to an explanation of the joint rules for the short session, Cathy’s memo has the text of the adjournment resolution, and a list of the bills that passed one house. Of the 212 bills on the list, two are in conference committee and four are back in the first house on the issue of concurrence. The remainder are in the second house awaiting action. The list does not include bills filed in 2007 that may be eligible because they directly and primarily affect the state budget. UPDATE 9/26: The list of eligible bills now has live hyperlinks to bill status (and then to the bill text) for each bill. UNC’s School of Government has posted two new websites useful to legislative researchers. The first is a searchable database listing forms of government of municipalities, the second a repository of interlocal agreements between municipal governments. The forms of government site replaces a publication dating back at least to 1969 (we have them back that far at the Legislative Library, updated and reissued every two years through the mid ’90s when reissuance became sporadic.) The online database will be very useful in drafting charter amendments and handling legislative research requests. What is blognetnews and why am I #8? Some outfit called blognetnews.com has published a list of North Carolina’s 20 Most Influential Political Blogs. I’m ranked as #8. I have absolutely no idea why. This blog is light stories, data, research tools and historical stuff. I assume that their metrics have to do with hits and incoming and outgoing links. Those would be imputed influence. I’m not sure who I am influencing with stories about pens and people who have had the same job for 50 years. Hat tip to Red Clay Citizen. It’s common knowledge that Presidents and Governors use special pens for bill signings, sometimes using one pen for each letter in their name. Article II, Section 22 of the North Carolina Constitution requires bills to be signed by the presiding officer of each house (usually the Speaker and Lieutenant Governor) before going on to the Governor. We’ve had special requests from the presiding officers. When Jimmie Green was Speaker and Lt. Governor, we had to use green ink. When Dan Blue was Speaker, we used blue ink. This year, we settled on a Pilot Precise Grip 1.0 mm bold pen. It wasn’t an official state contract purchased pen, it had simply shown up in then Enrolling Office earlier this year as we picked random pens from our stock to use. Lieutenant Governor Beverly Perdue liked the pen and asked that we stick with that pen. Speaker Hackney used his own pen early in the 2007 Session, but told Enrolling Clerk Karen Jenkins he liked the broad point of the pen that Lt. Governor Perdue was using, so we stuck with it. 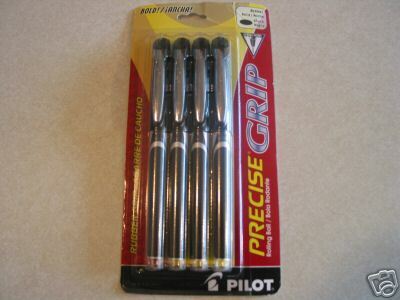 We had just one of the Pilot pens, (we don’t give them away) and our purchasing office did not find it on state contract, so yesterday I went and bought a pack of four myself on eBay for $1.98. Now we won’t have to worry as much about losing the pen. We often get requests from the media (and lobbyists, members, and the public) that go like this “Do you have a list of laws effective _____(fill in month)?”. Editors especially like lists of laws effective January 1. Our legislative library has put together and posted a list of North Carolina laws enacted in 2007 effective each month from July 2007 through January 2008. It covers through the extra session held September 10-11. It’s a 28 page .pdf file. The list is in order for each month by chapter number (chronological) and has a link to the text of the law and the bill status report. Back in 1971 when I was a political science graduate student at Chapel Hill, I started hanging around the General Assembly. I was fascinated by a Ford Foundation funded book published that spring, The Sometime Governments, a scathing attack on all 50 state legislatures through the eyes of reformers. (Of course, not everyone’s definition of reform is the same, and what seemed like a reform in 1971 may seem antiquated or even counterproductive now.) The book suggested 23 specific reforms for North Carolina. I finally got a job at the General Assembly in 1977, and eventually got around to writing my Masters Thesis in 2004, tracking the implementation of those reforms in North Carolina from 1971-2004. (11 implemented, 10 partially implemented) The audience for that document was, to say the least, rather limited. Earlier this year, I decided to update and shorten the document, give it more of a historical slant, and then dropped it from 98 to 64 pages and picked up actions from 2005-2007. I’ve posted it to the web. It includes tables on lengths of session, number of committees, committee assignments per member, and legislative budgets. It tracks the development of professional staff, electronic roll-call voting, open meetings, members’ staff, interim committees, the end of single-term speakers, the evolution of single-member districts, and a host of other topics. So for all of you who asked when I was going to get around to writing everything down, here it is, 35+ years of the history of legislative reform at the North Carolina General Assembly. Oh, and if you want to read my Masters Thesis, it’s posted too. There’s no copyright on either. Feel free to quote with attribution. You are currently browsing the Drafting Musings blog archives for September, 2007.